Victor & Penny are headed to Fayetteville this month for a concert and workshop, thanks to a grant from the Mid-America Arts Alliance. The free workshop is at 6 p.m. Feb. 13 inside the Fayetteville Public Library, 401 W. Mountain Street. During the event, Jeff Freling and Erin McGrane of Victor & Penny will perform and lead a discussion on the roots and evolution of riff-driven Kansas City-style jazz. The following night (Feb. 14) the three-piece Loose Change Orchestra will join Victor & Penny for a concert at 7:30 p.m. in the University of Arkansas’ Faulkner Center. Tickets are $10-$20 and can be purchased at faulkner.uark.edu or by calling the box office Monday through Friday between 1:30-5 p.m. at 479-575-5387. Victor & Penny (Jeff Freling and Erin McGrane) – vocals, guitar and ukulele – have been performing their folk-jazz together since 2010 and building a national reputation. 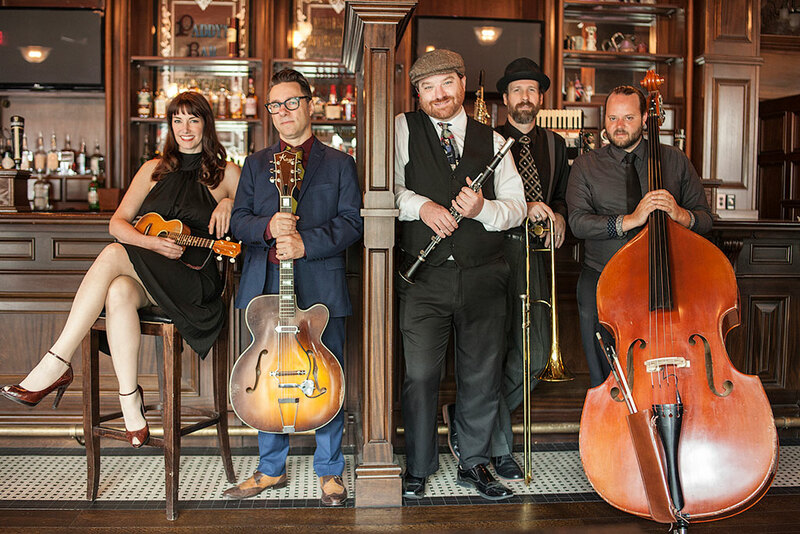 The Loose Change Orchestra, with James Isaac on reeds, multi-instrumentalist Kyle Dahlquist and bassist Rick Willoughby, adds an extra kick to the group’s blend of originals, hot jazz and swing.